this picture is wonderfull sveet cute!!!!!!!!!!!!!!!!!!!!!!!!!!!! OMG! That is sooo cute! Sakura and Sasuke, Naruto and Hinata, Shikamaru and Ino... it's great. Quote by Chloe-chanOMG! That is sooo cute! Sakura and Sasuke, Naruto and Hinata, Shikamaru and Ino... it's great. So nice and cute !!! I love it !!! You are awesome !! Thank for sharing ti with us !!!! Hey hey hey!!! What'd I told you kids to Keep Off the Grass!!! Okay, so I like the entire concept. A nice kiddie theme. Reminds me of a game of falshlight tag, I dunno why. The starfield needs some work. You should try using some effects when making stars. Play around with the lighting effects also. Chibi Naruto... Fireflies ba yan? Kung oo, medyo hindi halata. But I'll give you a nice "Astig" for the whole wallie. wow very cute and very simple. i like the characters it reminds me of cute cousins except without the kimono thing. the grasses are so green and it is so beautiful. though te sky is empty and bare. 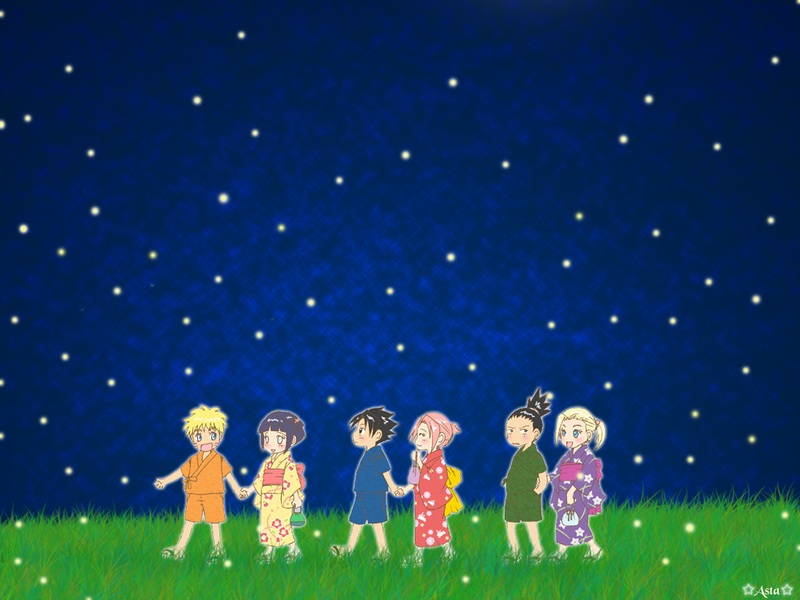 just add moe details in it, and the fireflies, are they really fireflies? dont line them like snow ok. but generally very cute wallie. Hehe, they're like, parading off to a fair or something. Cute pics, the simple bg works with the chibis, has sort of a kiddish feel! Kawaii!! I like chibis!! uhmm.. yeah.. for a second there, i was disappointed to see ShikaIno.. i prefer ShikaTema.. but it's still cute! thanks for sharing!! it's cute with all couples! loved it!